At least 161 people were killed and over 5,700 injured when a powerful 7.0-magnitude earthquake rocked southwest China's Sichuan province on Saturday, flattening more than 10,000 homes in a seismic mountainous region. 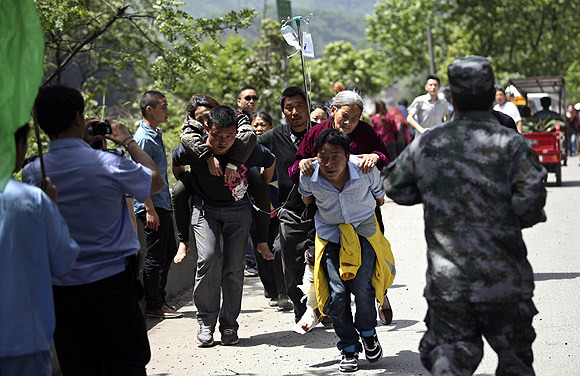 The quake struck the province on the edge of the Tibetan Plateau at 8:02 am, prompting a major relief and rescue operation in the same area where 90,000 people were reported dead or missing in a massive quake in 2008. Ten hours after the quake hit Lushan County in the city of Ya'an, the death toll stood at 161, state television station CCTV said on the Twitter-like Sina Weibo, citing the China Earthquake Administration. The quake flattened the historic Lushan County and iconic Ya'an City, home of endangered giant Pandas, on the foot hills of the Tibetan plateau. Over 5,700 people were injured. The condition of over 200 injured victims was reportedly serious, Chinese officials said. To help rescue operations, nearly 6,000 soldiers and police were heading to the area, state-run Xinhua news agency said. The quake in the mountainous area shook hills, triggering landslides, besides causing heavy damage to the concrete structures. At least 10,000 homes were destroyed, the Sichuan government said. Adapt at dealing with massive earthquakes with skills acquired from both the 2008 Sichuan and the 2010 Qinghai quakes, China mobilised thousands of rescuers, including over 2,500 army troopers from provincial capital Chengdu, which also felt the tremors in the morning. A total of 264 aftershocks had been monitored, two of which were above 5.0-magnitude, according to the CENC. Ya'an city lies between the Sichuan basin and the Qinghai-Tibet Plateau. This is regarded as the most seismic active area, where the two massive plates at the earth's crest meet. The city has a population of 1.53 million people. In 2006, the area surrounding Ya'an, a natural panda habitat, was listed as a world natural heritage site. Bifeng Gorge base, a panda research base affiliated to the Wolong Giant Panda Protection and Research Centre which is only 47 km from the epicenter, has no reports of human or panda casualties, said Yu Xiaoying, a staff member. In the later years, most of the Pandas were shifted to Chengdu, where their habitat was built. The quake also tested the coordination skills of China's new leaders. While President Xi Jinping ordered troops in the quake-hit zone to make "every possible effort" to rescue those trapped under the debris, Premier Li Keqiang flew to Ya'an city hours after the earthquake, where he personally began coordinating rescue efforts. A soldier was killed and several others were injured when a China Army vehicle, on its way to a rescue operation, fell into a river. The worst-hit areas are in the townships of Longmen and Qingren, said Jin Zelin, an official with the provincial armed police corps. "At least 24 people have died and 300 are injured, 50 of them seriously, in Longmen town," a government official told Xinhua. "Old houses in Gucheng village, with a population of 3,000, totally collapsed. More than 95 per cent of the houses in the village are not fit for living in," he said. China also pressed helicopters and reconnaissance planes to access the damage. Three townships of Taiping, Baosheng and Dachuan in Lushan County remain cut off. The water and electricity supply in the county has snapped due to the quake. 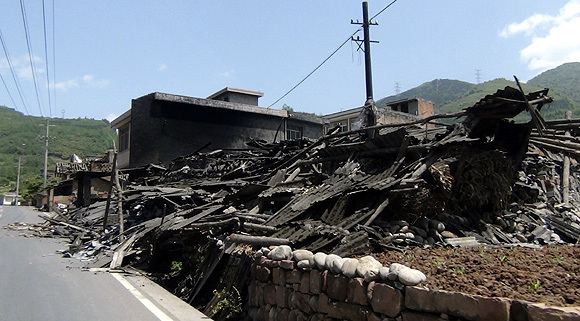 Most of the buildings in the old urban area of Lushan county and Longmen township collapsed in the quake, according to the local government's statement. Landslides have blocked traffic in many places across the county. Two barrier lakes caused by the landslides are hampering the rescue efforts. 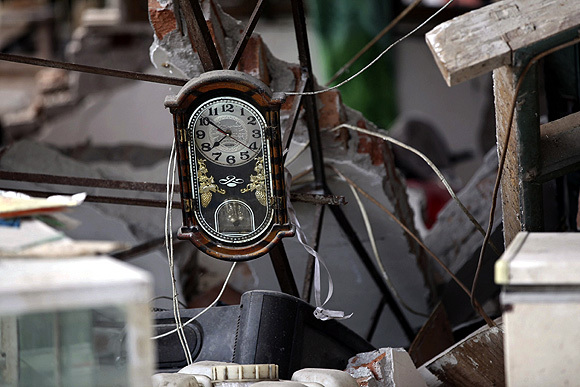 The Ya'an quake has resulted in serious casualties and economic losses, but it is not expected to be as disastrous as the 8.0-magnitude Wenchuan quake, said Pan Huaiwen, director of the China Earthquake Networks Centre. Pan warned of aftershocks and secondary disasters, including landslides, mud-rock flows, and the collapse of caves and riverbanks. Jiang Haikun, an official with the CENC's forecasting department, said the Ya'an quake resembles the Wenchuan disaster, as both earthquakes were formed in a similar way, occurring on the Longmen mountain fault zone. Earthquakes on this 500-km belt are not frequent but very powerful. Twelve quakes above 5.0-magnitude have occurred since 1900, Jiang said. A total of 12 earthquakes of 5.0-magnitude or above have occurred in the area within 100 kilometers of its epicenter since 1900, including the devastating Wenchuan quake in 2008. Images: World's first PANDA themed hotel in China!